On Friday the 13th, I gave the morning keynote at the Online Northwest Conference in Corvallis, OR. Thanks so much to the organization for inviting me. Last October, I was driving home from a hackathon when I heard something extraordinary on the radio. 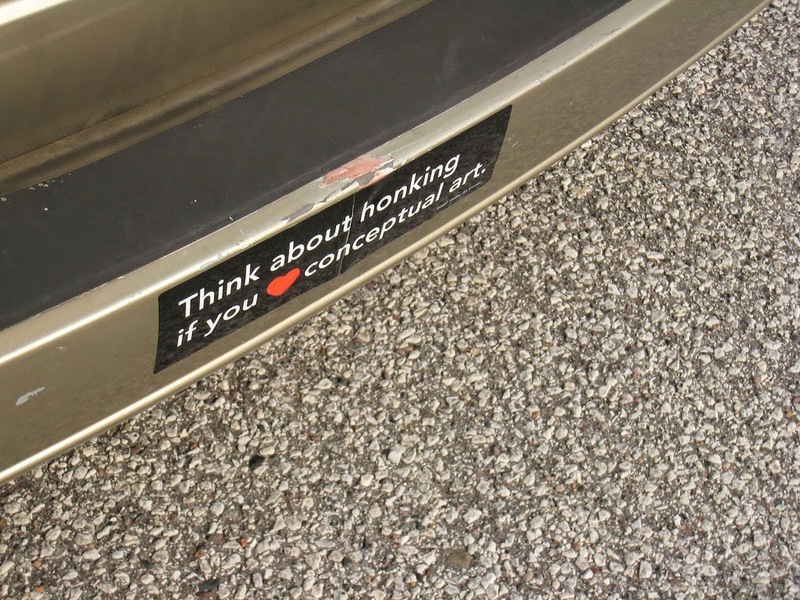 Now, as human beings, we tend to get over-excited by coincidence - it’s a particular cognitive bias called the frequency illusion - you buy a gold station wagon and suddenly you see gold station wagons everywhere (yes, that’s my gold station wagon behind me). But that being said, I still contend that there was something special about what I heard and when I heard it. Because you don’t hear people talking about Open Data on the radio very often. So here’s the brief backstory. The local technology incubator in partnership with the local hackerspace that I’m involved with was co-hosting a week long hackathon to celebrate Science and Technology Week. I was just returning from its kick-off event where I had just given a presentation on the role of licensing in Open Data. This particular hackathon was a judged event, with the three top prizes being a smart watch, admission to an app commercialization seminar, and an exclusive dinner with an expert in the commercialization of apps -- which was kind of odd since the data sets that were provided for the event were sets like pollution monitoring data from the Detroit River, but hey - that’s the part of the challenge of making commercial apps out of open data. One of the most common definitions of Open Data comes from the Open Knowledge Foundation: Open data is data that can be freely used, reused and redistributed by anyone - subject only, at most, to the requirement to attribute and sharealike. So, using this definition, a creative commons license of CC-BY : which means that the work has been designated in the creative commons as free to use without requiring permission as long as there is attribution is given is considered Open Data. But CC-NC which stands for Creative Commons Non-Commercial is not considered Open Data because the domain of use has been restricted. We in librarianship talk a lot about open source, and open access, but even we don’t talk about open data very much. So that’s why I was so surprised when there was a conversation coming from my car radio on the importance of Open Data. Granted, I was listening to campus Radio - but still, I think I reserve the right to be impressed by how the stars seemed to have aligned just for me. The show I was listening to was Paul Chislett’s The Shake Up on CJAM and he was interviewing Paula Z. Segal, the lead executive of a Brooklyn-based organization called 596 Acres. Her organization builds online tools that makes use of Open Data to allow neighbours to find the vacant public land hidden in plain sight in the city as the first step in the process of turning them into shared resources, such as community gardens. Perhaps not surprising to you now, but in 2011 there was 596 acres of such empty lots in Brooklyn alone. Segal was telling the radio host and the listening audience that many communities make data - such as data that describes what land is designated for what purpose - open and accessible to its residents. However, most citizens don’t know that the data exists because the data is contained in obscure portals, and if even if they did find the data, they generally do not understand how to handle the data, how to make sense of it and how to make it meaningful to their experiences. Now when I heard that and whenever I hear similar complaints that the promise of Open Data has failed because it tends to add power to already powerful, I keep thinking the same thing - this is a job for librarians. We didn’t build libraries for a literate citizenry. We built libraries to help citizens become literate. Today we build open data portals not because we have public policy literate citizens, we build them so that citizens may become literate in public policy. This brings us to the theme of this morning’s talk- which is not Open Data - although I will express today's theme through it largely because I’m back from a year’s sabbatical immersed in the topic and it’s still difficult for me to not talk about it. No, today I would like to make a case for a creating a nationwide program to put more librarians into more communities and into more community organizations. I have to warn you that I'm not going to give you any particulars about what shape or scope of what such a program could be; I'm just going to try to make a case for such an endeavor. I haven't even thought of a good name for it. The best I can come up with is Librarianing for America. 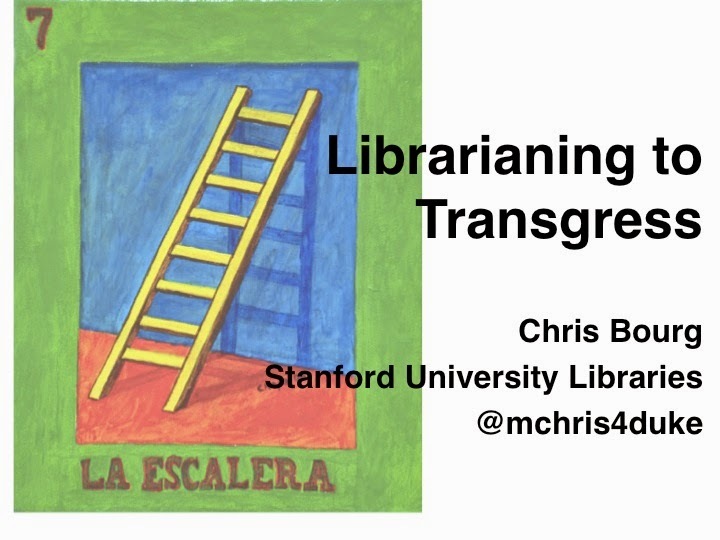 On that note, I would like to give a shout-out to Chris Bourg for - if not coining the word librarianing - for at least, bringing to my attention. And I very much hope that perchance the stars will align again and this theme will complement the work that I am very much looking forward to hearing today at Online Northwest : about digitally inclusive communities, about designing and publishing, about being embedded, about sensemaking through visualization, about enhancing access and being committed to outreach. Before I continue I feel I should disclose that I’m not actually American. 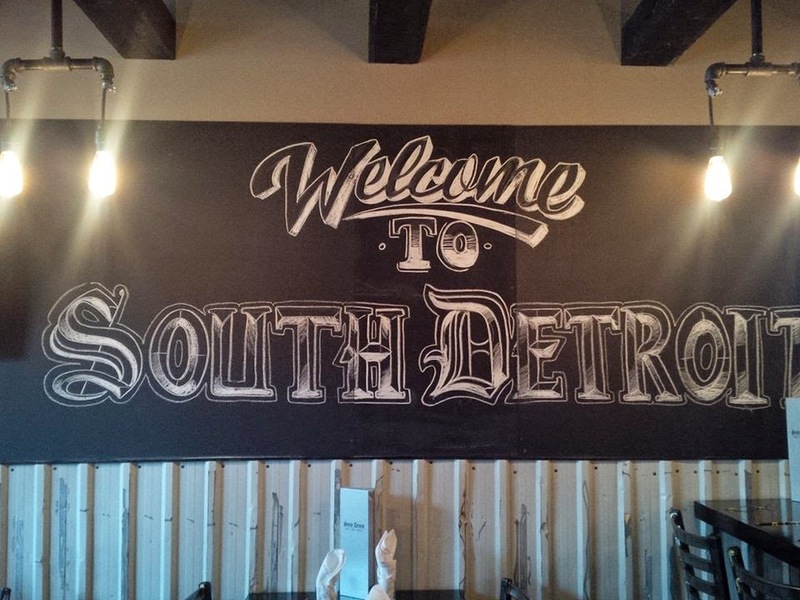 I grew up across the river from Port Huron, Michigan and I now live across the river from Detroit, Michigan. I literally can see Detroit from my house. And Detroit is the setting for my next story. A quick aside first - my research interest in open data has been largely focused on geospatial data as well as the new software options and platforms that are making web mapping much more accessible and viable for individuals and community groups when compared to the complex geographic information systems commonly known as GIS - that institutions such as city governments and academic libraries tend to exclusively support. I mention this as a means to explain why I decided to crash the inaugural meeting of Maptime Detroit that happened in early November last year. Maptime is time designated to making maps. It is the result of kind volunteers who find a space, designate a time, and extend an open invitation to anyone who is interested to drop in and learn about making maps. It started in San Francisco a couple of years ago and now there are over 40 Maptime Chapters around the world. Now, when I went to the first Maptime Detroit event, there wasn’t actually any time given to make maps. For this inaugural meeting, instead there was a set of speakers who were already using mapping in their work. Not very many people know that Detroit has an amazing history of citizen mapping initiatives - the map behind me is from The Detroit Geographical Expedition from their work Field Notes Three from 1970. I think you could make a case that another kind of community mapping outreach work is starting to emerge again through the many community initiatives that are supported by mapping that is happening in Detroit today. Many of the organizations who are doing community mapping work were presenting at Maptime Detroit including Justin Wedes, an organizer from the Detroit Water Brigade. As you might already know, the city of Detroit declared bankruptcy in 2013 with debts somewhere between $18 to $20 billion dollars. The city is collapsing upon itself at a scale that’s very difficult to wrap one’s mind around. The Detroit Water and Sewage Department is currently conducting mass water shut offs in the city which will affect over 120,000 account holders over an 18 month period at a rate of 3,000 per week. 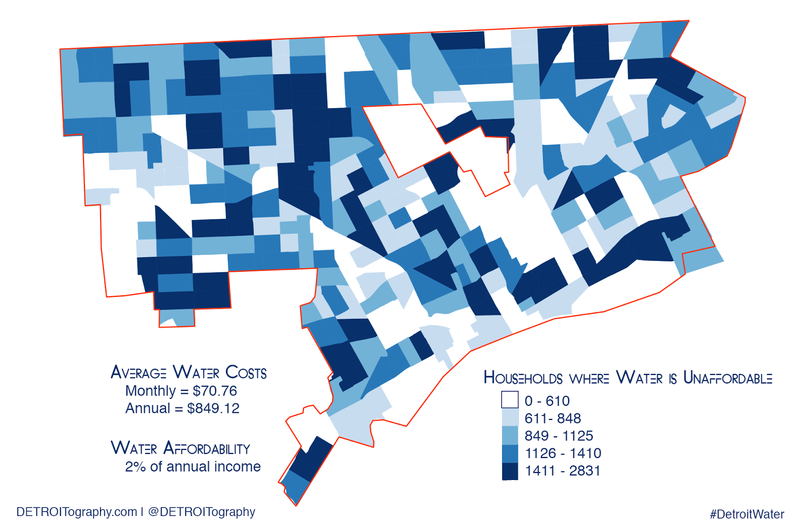 This will account for over 40% of customers who are using the Detroit Water system. As 70,000 of those accounts are residential accounts, it is thought that 200,000-300,000 people could be directly affected. The Detroit Water Brigade coordinates volunteers efforts in the distribution of bottled water to affected neighbours as well as acts an advocate for the UN recognized human right to water on behalf of Detroiters. But at Maptime Detroit, Justin Wedes didn’t begin his talk with his work in Detroit. Instead he began his presentation by speaking about of his experiences with Occupy Sandy. In October of 2012, while New York’s FEMA offices were closed due to bad weather, veterans from the Occupy Wall Street community came forward and used their organization skills to mobilize ground support for those who needed it most. 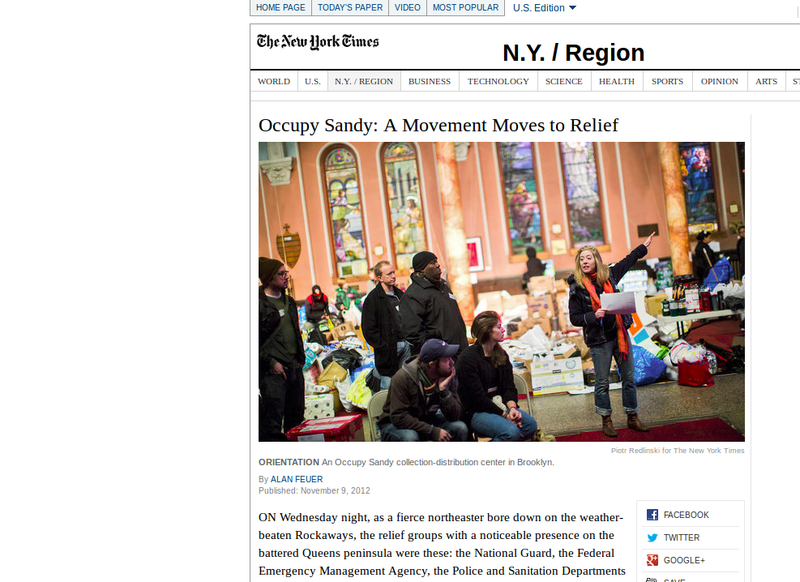 At first, Occupy Sandy was using free online services such Google Spreadsheets and Amazon’s Web Registry to collect and redistribute donations but by the end of their work, they had started using the exact same software that the city of New York uses for dispatching resources during disasters. Wedes described the work of the Detroit Water Brigade and as he did so, he also told us how very different his experiences were in Detroit as compared to his ones in New York after Superstorm Sandy. After Sandy hit, he told us, those New Yorkers who could help their more badly damaged neighbours did so with great enthusiasm and that help was well received. With the water shutoffs in Detroit, however, Justin feels there is an underlying sense of shame in accepting help and the response from the community at large is more restrained. When he said this, the first thing that came to my mind was an article I had read years ago by Rebecca Solnit in Harper’s Magazine. In that article, which was later expanded into a book called A Paradise Built in Hell: The Extraordinary Communities That Arise in Disaster, Solnit makes an observation humanity opens itself to great compassion and community when a disaster is brought on by weather but this capacity is strikingly less so when that disaster is man-made. There are many reasons why this water shut-off situation in Detroit came about and I'm not going to go into them, largely because I don't fully understand how things got to become so dire. I just want to draw attention to the tragic dynamic at hand: as the problems of Detroit grow - due to less people being about to pay for an increasingly costly and crumbling infrastructure, the capacity of the city government to deal with the worsening situation in turn, is also reduced. One of the more striking datasets that's both explorable through a map as well as available for download as open data, is Detroit Property Information through the Motor City Mapping project. In In the fall of 2013, a team of 150 surveyed the entire city and took photos and captured condition information for every property in the city of Detroit. According to their information at this given moment, of Detroit's 374,706 properties surveyed, 25,317 are publicly owned structures. Of those, 18,410 are unoccupied, 13,570 require boarding up, and the condition of 2511 of these buildings are so poor that demolition is suggested. Now, I can only speak for myself, but when I see these kind of projects it makes me want to learn the computer based wizardry that would allow me to do similar things. Because while I do enjoy the intellectual work that's involved with computer technology, what really inspires me is this idea that through learning to program, I can gain superpowers that take masses amount of data and do some good with them at the scales of a city. In short, I want to have to the powers of Tiffani Ashley Bell. Tiffani heard about the plight of water-deprived Detroiters last July and after being urged on by a friend, she sat down and came up with the core of The Detroit Water Project in about four hours. The Detroit Water Project pairs donors with someone in Detroit with an outstanding water bill and makes it possible for these donors to directly contribute to their water bill. Since the project started in July, over 8000 donors have paid $300,000 directly towards water bills. Now, while I think this project is incredibly valuable and very touching as allows donors to directly improve the situation of one household in Detroit, the project admittedly does not change the dynamics involved that gave the grievous situation at hand. So what is to be done? How can we combine the power of open data, computer code, and the intention to do good to make more systematic changes? How can we support and help the residents and the City of Detroit doing the good work that they already do? This where I think another organization comes in: Code for America. Code for America believes it can help government be more responsive to its residents by embedding those who can read and write code into the city government itself. It formed in 2009 and it works by enlisting technology and design professionals to work with city governments in the United States in year long fellowships in order to build open-source applications that promote openness, participation, and efficiency in government. In other words, it's a combination of service and app building that is paid for by the city, usually with the help of corporate sponsors. Each year Code for America selects 8-10 local government partners from across the US and 24-30 fellows for the program through a competitive application process. In 2012, the Knight Foundation and Kellogg Foundation funded three Code for America fellows for a residency in Detroit. These Code for America fellows worked with the Detroit Department of Transportation to release a real-time transit API and build the TextMyBus bus notification system which launched in September of that year. In addition to TextMyBus, the fellows also built an app called Localdata to standardize location-based data collected by data analysts and community groups. "Localdata offers a mobile collection tool with a map interface as well as a paper collection option that can be scanned and uploaded for data syncing." This particular project joined the Code for America Incubator and has since expanded into a civic tech startup company. In my mind, Code for America can be thought of as a scaled up version of a civic hackathon. If you aren't familiar with hackathons, they are a generally weekend affair in which participants work solo or in groups to code a website or app that ostensibly solves a problem. Sometimes there are prizes and sometimes the event is designed as a means to generate the first concept of a potential start-up. 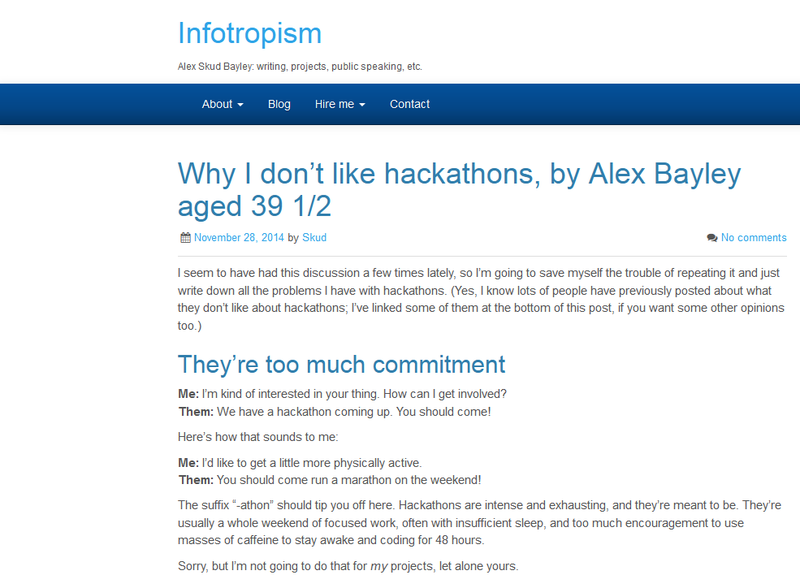 Hackathons can be a good thing - you might remember from the beginning of my talk that I sometimes help out with them which I means that I endorse them - but I do admit that that have their limits (many of which are described in this blog post behind me). For one, it’s simply not reasonable to expect that a weekend of hacking is going to result in a wonderful app that will meet the needs of users that the programmers have likely not even met. But, with good event design that strives incorporates mentorship, workshops, and opportunities to meet with potential users of said apps, hackathons can be a great start towards a future collaborations. Code for America also incorporates mentorship and training into its process. 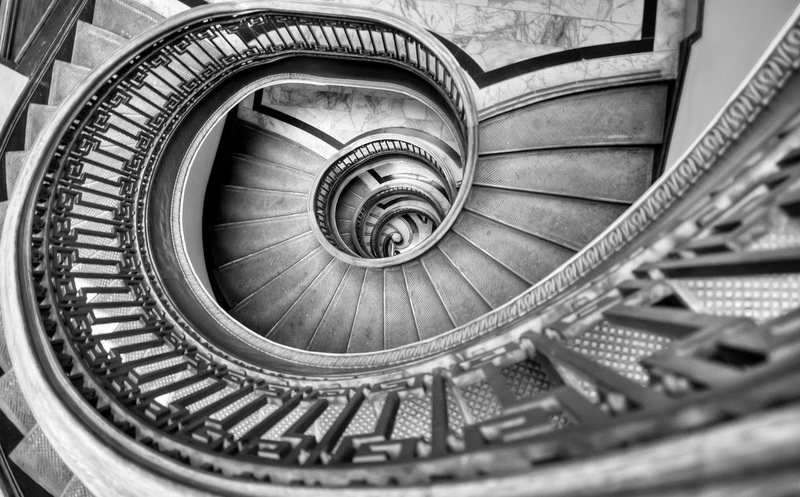 Those selected for a fellowship begin at an institute in San Francisco where fellows receive training about how local government and agencies work, how to negotiate and communicate as well as how to plan, and focus their future code work. That being said, Code for America has its own limitations as well. This particular article gently suggests that Code for America may - in some instances - seem to benefit the fellows involved more than the cities themselves. For one, it costs a city a lot of money - $440,000 - just to support a set of Code for America fellows for a year and then, after they leave, the city needs to be able to have the capacity to support the care and feeding of the open source apps that have been left behind. If only there were people who could also help cities help their communities who didn’t have to be flown in and disappear after a year. If there was only some group of people who could partner with cities and their residents who already had some experience and expertise in open data licensing, and who understood the importance of standardizing descriptors in datasets, who were driven to improve better user experience, and who understood that data use requires data literacy which demands both teaching and community outreach. Friends, this is work that we - librarians can be doing. And our communities need us. Our cities need us. Furthermore, I don't know whether you've noticed but every year emerges another an amazing class of passionate and talented freshly minted librarians and we are simply not building enough libraries to put them in. So I think it’s time to work towards making our own Librarianing for America. I don’t think it’s possible to model ourselves directly on Code for America. It’s not likely we are going to find cities willing to pay $440,000 for the privilege to host 3 librarians for a year. At least, not initially. Let’s call that our stretch goal. We can start out small. Perhaps librarians could participate in one of the 137 Code for America Brigades that bring together civic-minded volunteers to work together via meetups. There are a variety of other organizations that also draw on civic minded volunteers to work together towards other goals including the Open Knowledge Foundation, hack4good, CrisisMappers, and the Humanitarian OpenStreetMap Team. Or perhaps we can follow the lead of libraries such as the Edmonton Public Library, York University Libraries, The Chattanooga Public Library, and the University of Ottawa, who have all hosted hackathons for their communities. This is a slide that’s admittedly out of context. I took it from a Code for America presentation and I'm not sure how precise this statistic of 75% is to their project and even whether it can be widely applied to all projects. But, I do think it is safe to say that programming code is only as good as its data is clean and meaningful. And I say this because I don't believe that librarians have to know how to program in order to participate in Librarianing for America. I believe our existing skillset lends itself to the cause. Our values and our talents are greatly under appreciated by many, many people including librarians themselves. But it appears that that the talent of librarians is starting to be recognized. The City of Boston recently was awarded a Knight Foundation grant for the specific purpose of hiring a librarian as part of a larger team to turn the City of Boston’s many Open Datasets into something findable, usable, and meaningful by its residents. And perhaps we can learn and expand on the work of ILEAD USA. 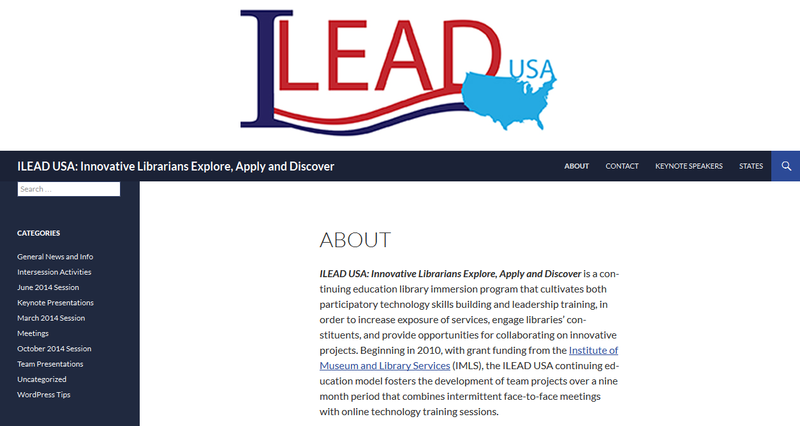 ILEAD USA gathers librarians together with the goal to develop a team projects over a nine month period through a combination of intermittent face-to-face meetings and online technology training sessions. At the end of nine months, each team presents their project to the entire ILEAD USA audience, with the goal of either sustaining these projects as ongoing library programs or directly applying the knowledge gained from ILEAD USA to future collaborative projects. Now when I first proposed this talk, I was unaware of the work of the ILEAD program. And since then I’ve had the pleasure to speak with the its project director on the phone. I asked her if she was familiar with Code for America and she told me no, although she did know about Teach for America. I don’t know about you, but to me, ILEAD sounds a little bit like Librarianing for America to me. Or at least it sounds like what one possible form that it could take. Or it could be that Librarianing for America could be a placement service that matched and embedded librarians with non-profits. The non-profits could gain from the technical and material experiences of the librarian and the librarian would be able learn more about the needs of the community and form partnerships that can only occur when we step outside of our buildings. I don't think it's so far-fetched. Last year, my local hackerspace received three years of provincial funding to hire a staff coordinator to run a number of Open Data hackathons, host community roundtables and pay small stipends to community members who help in our efforts to making open data from the non-profit community more readily available to the community they serve. Now it just might be the Frequency Illusion, but I prefer to think it is as if the stars are aligning for libraries and their communities.. At least they appear so when I look up towards our shared horizon. Thank you all for kind attention this morning and I very much look forward to spending this day librarianing with everyone here at OnlineNorthwest.. But after inspection, it looks like the RSS feed that is generated by Feedburner has been updated in such a way that I - using feedly - I needed to re-subscribe. Now, I'm not sure who is at fault for this: Feedburner, feedly, or myself for using a third party to distribute a perfectly good rss feed. I don't follow my reading statistics very closely but I do know that the traffic to this site is largely driven by Twitter and Facebook -- much more than hits from, say, other blogs. And yet, I'm disturbed that the 118 readers using the now defunct feedly rss feed will not know about what I'm writing now. I'm sad because while I've always had a small audience for this blog - I have always been very proud and humbled that I had this readership because attention is a gift. Hackerspaces, Makerspaces, Fab Labs, TechShops, Incubators, Accelerators... Where do libraries fit in? Today’s session is going to start out as a field guide but it’s going to end with a history lesson. We’re going to start here - with a space station called c-base that found/ed in Berlin in 1995. And then we are going travel through time and space to the present day where business start-up incubator innovation labs are everywhere including CBASE which is the College of Business and Economics from the University of Guelph. But before we figure out where libraries makerspaces fit in, we’re going to use the c-base space station to go back in time, just before the very first public libraries were established around the world, so we can figure out how to go back to the future we want. 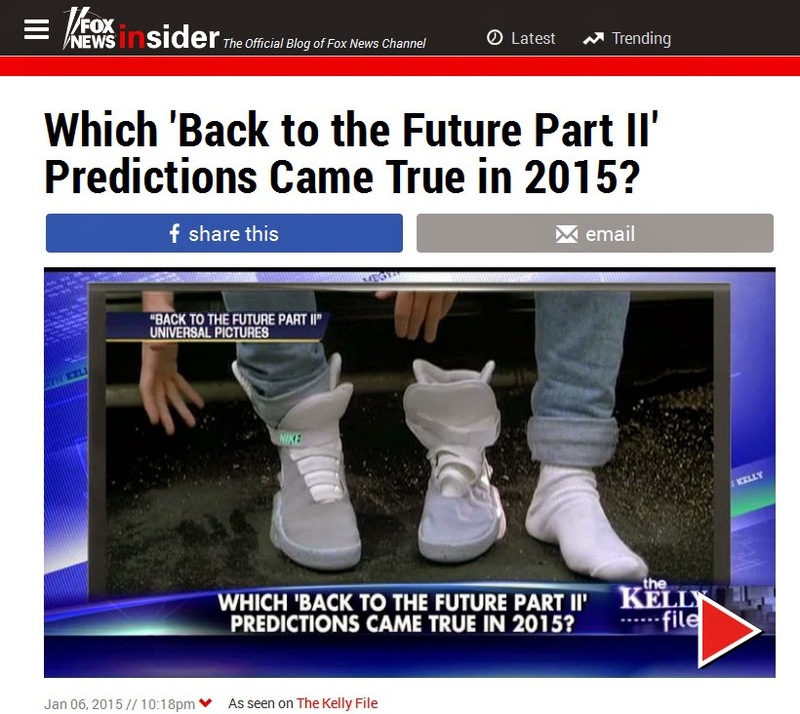 It is 2015, after all. 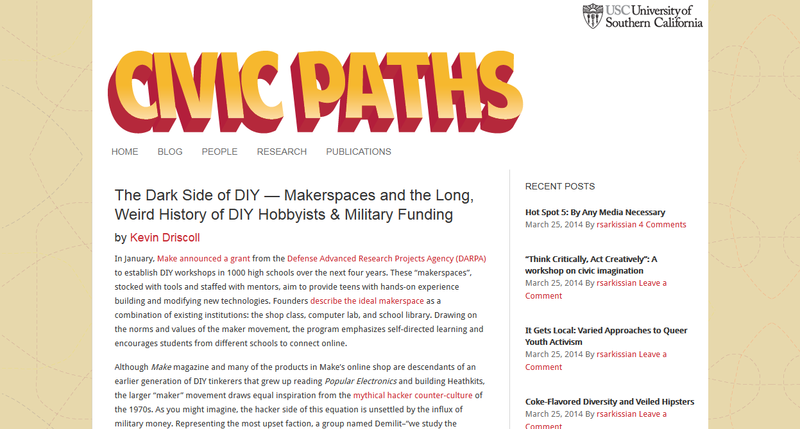 But before we can talk about library makerspaces, we need to talk about hackerspaces. This is the inside of c-base. c-base is considered one of - or perhaps even - the very first hackerspace. It was established in 1995 by self-proclaimed nerds, sci-fi fans, and digital activists who tell us that c-base was built from a reconstructed space station that fell to earth, then somehow became buried, and when it was uncovered it was found to be borne with the inscription : be future compatible. The c-base is described as a system of seven concentric rings that can move in relation to each other. These rings are called core, com, culture, creative, cience, carbon and clamp. Beyond its own many activities, c-base has become the meeting place for German Wikipedians and it’s where the German Pirate Party was first established. 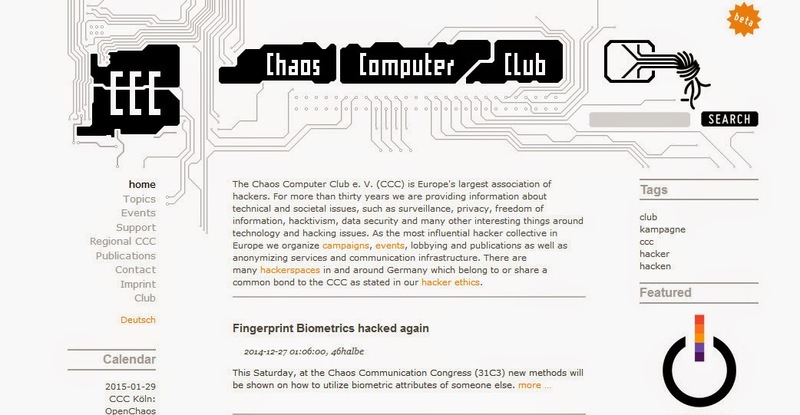 Members of c-base have been known to present at events hosted by the Chaos Computer Club, which is Europe's largest association of hackers that's been around for 30 years now. So c-base is a hackerspace that is actually inhabited by what we commonly think of as hackers. Some of the earliest hackerspaces were directly inspired by c-base. There is story that goes that in August of 2007, a group of North American hackers visited Germany for Chaos Communication Camp and was so impressed that when came back, they formed the first hackerspaces in the United States including NYC Resistor (2007), HacDC (2007), and Noisebridge (San Francisco, 2008). 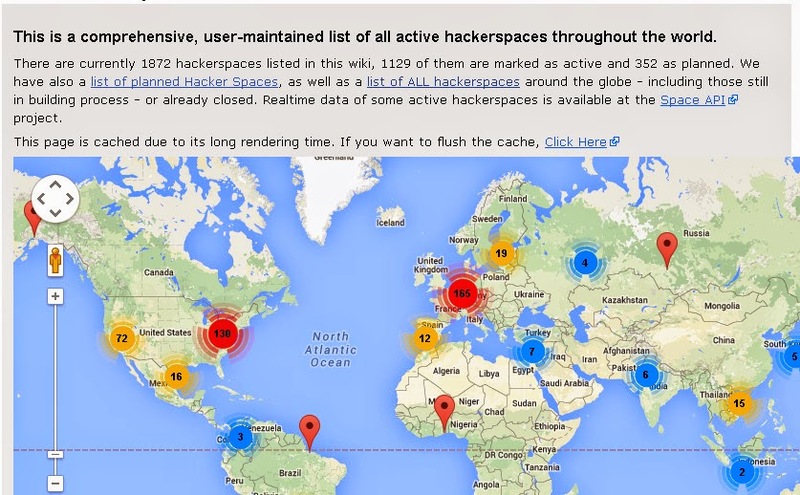 Since then, many, many more hackerspaces have been developed - there are at least a thousand - but behind these new spaces are organizations that have are much less counter-culture in their orientation than the mothership of c-base. 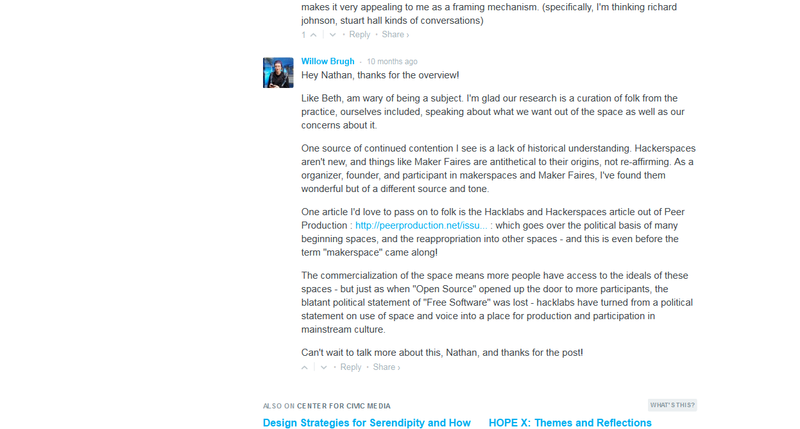 In fact, at this moment, you could say there isn’t a clear delineation between hackerspaces and makerspaces at all. But before we can start talking about makerspaces, I think it’s necessary to pay a visit two branches of the hackerspace evolutionary tree: TechShops and Fab Labs. TechShop is a business that started in 2006 which provides - in return for a monthly membership - access to space that contains over a half a million dollars of equipment, generally including an electronics lab, a machine shop, a wood shop, a metal working shop, etc. There are only 8 of these TechShops across the US despite earlier predictions that would be about 20 of them by now. They have been slow to open because the owner has stated that the business requires at least 800 people willing to pay over $100 a month in order for a TechShop to be viable. The motto of TechShop is Build Your Dreams here. But TechShops have been largely understood as places where members dream of prototypes for their future Kickstarter projects. And such dreams have already come true: the prototype of the Square credit card processing reader, for example, was built in a Techshop. I think it's telling that the Detroit Techshop has a bright red phone in the space that connects you directly to the United States Patent and Trademark Office in case of a patent emergency. Three of out of the 8 TechShops have backing from other organizations. TechShop's Detroit center opened in 2012 in partnership with Ford, which gives its employees free membership for three months. Ford employees can claim patents for themselves or they can give them to Ford in exchange for a share in revenue generated. 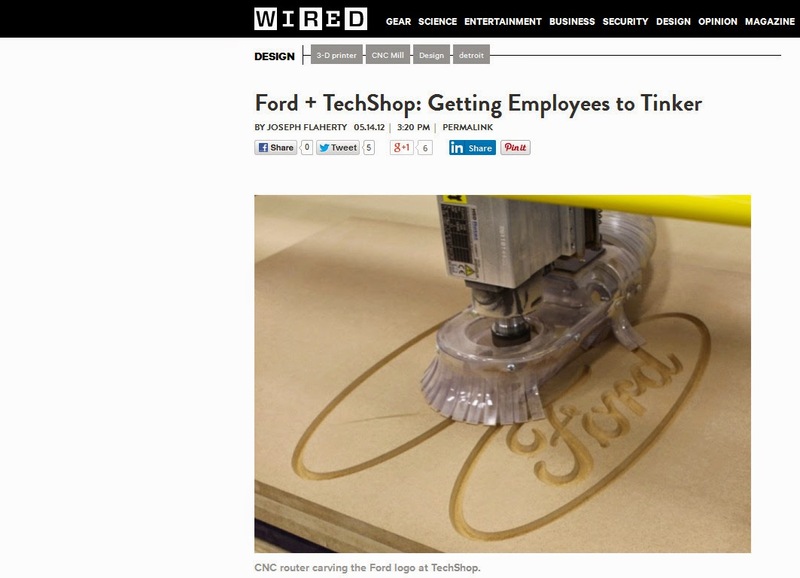 Ford claims that this partnership with TechShop has led to a 50% rise in the number of patentable ideas put forward by the carmaker's employees, in one year. 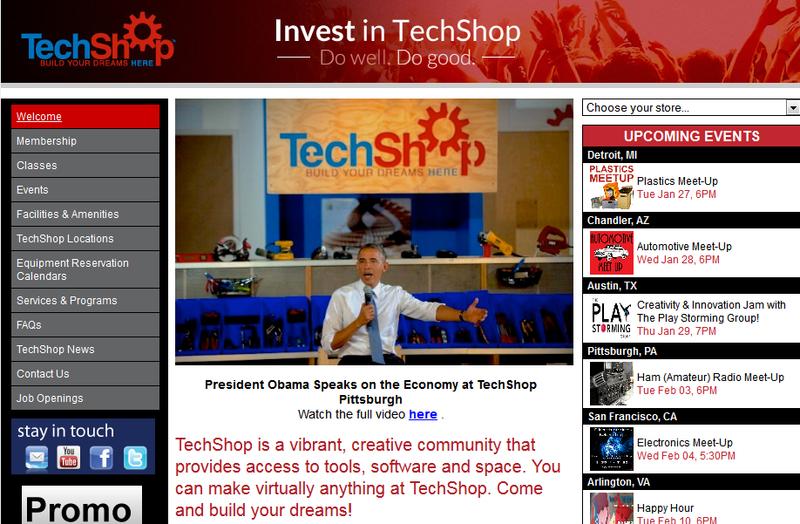 TechShop's offices in Washington DC and Pittsburgh are being sponsored by DARPA, an agency of the Defense Department. DARPA is reported to have invested $3.5 million dollars into TechShop as part of its “broad mission to see if regular citizens can outinvent military contractors on some of its weirder projects.” But DARPA is not just helping pay for the space, they supposedly use the space themselves. According to the Bloomberg Business Week story I read, DARPA employees arrive at midnight to work when the TechShop is closed to its regular members. You might be surprised, but we're going to be talking about DARPA again during this talk. But before that, we need to visit another franchise-like type of makerspace called the Fab Lab. 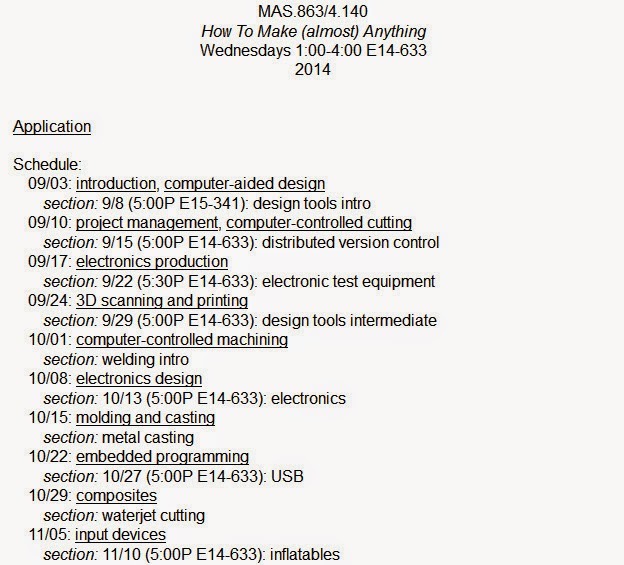 In 1998, Neil Gershenfeld started a class at MIT called "How to make (almost) anything". Gershenfeld wanted to introduce industrial-size machines normally inaccessible to technical students. However, he found his class also attracted a lot of students from various backgrounds including artists, architects, and designers. This led to a larger collaboration which eventually resulted in the Fab Lab Project which began in 2001. Fab Lab began as an educational outreach program from MIT but the idea has since developed into an ambitious network of labs located around the world. The idea behind Fab Lab is that the space should provide a core set of tools powered by open source software that allow novice makers to make almost anything given a brief introduction to engineering and design education. 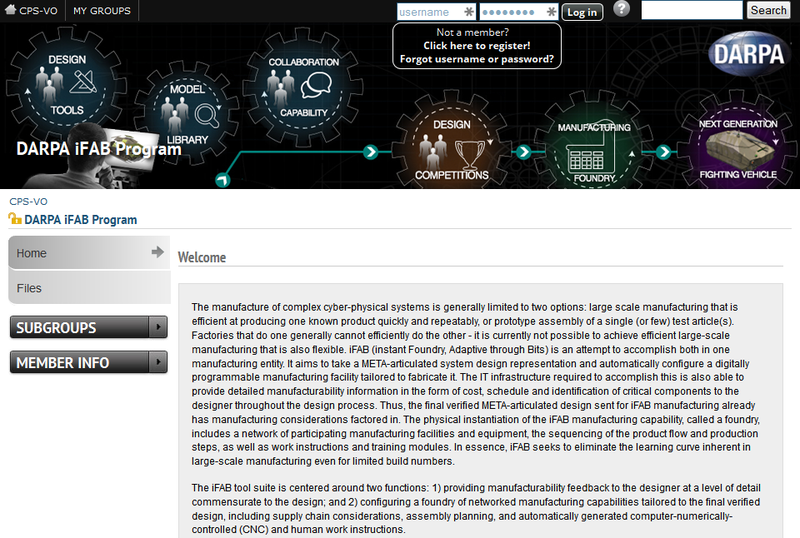 Anyone can create a recognized Fab Lab as long as it makes a strong effort uphold the criteria of a Fab Lab, with the most important being that Fab Labs are required to be regularly open to the public for little or no cost. While it's not required, a Fab Lab is also strongly encouraged to communicate and collaborate with the other 350 or so other Fab Labs around the world. The idea is that, for example, if you design and make something using Fab Lab equipment in Boston, you could send the files and documents to someone in the Cape Town Fab Lab who could the same using their equipment. The first library makerspace was a Fab Lab. It was established in 2011 in the Fayetteville Free Library in the state of New York. That's Lauren Britton pictured on screen who was a driving force that helped make that happen. Now we don't tend to talk about Fab Labs in libraries. We talk about makerspaces. I think this is for several reasons with one of the main ones being - as admirable as I personally find the goals of international collaboration through open source and standardization - the established minimum baseline for such a Fab Lab generally costs between $25,000 and $65,000 in capital costs alone. This means that a proper Fab Lab is out of reach for many communities and smaller organizations. I think there's another reason why we think of makerspaces before we think of Fab Labs, TechShops or hackerspaces. And that's because of Make Magazine. Started in 2005 from the influential source of so many essential computer books, O'Reilly Publishing, Make Magazine was going to be called Hack. But then the daughter of founder Dale Dougherty told him that hacking didn’t sound good, and she didn’t like it. Instead, she suggested he call the magazine MAKE instead, because ‘everyone likes making things’. And there is something to be said for having a more inclusive name, and something less threatening than hackerspace. But I think there's more to it as well. There is a freedom that comes with the name of makerspace. One my favourite things about makerspaces is that most of them are open to everyone - artists, scientists, educators, hobbyists, hackers and entrepreneurs and it is possibility for cross-pollination of ideas that is one of the espoused benefits of their spaces for their members. In a world where there's so much specialization, makerspaces are a force that are trying to bring different groups of people together. Here's such an example. This is i3Detroit which calls itself a DIY co-working space that is a "a collision of art, technology and collaboration". There are also makerspaces that are more heavily arts-based. Miss Despoinas is a salon for experimental research and radical aesthetics that hosts workshops using code in contemporary art practice. It is physically located in Hobart, Tasmania. There are presumably makerspaces that are designed primarily for the launching of new companies, although the only one I could find was Haxlr8r . 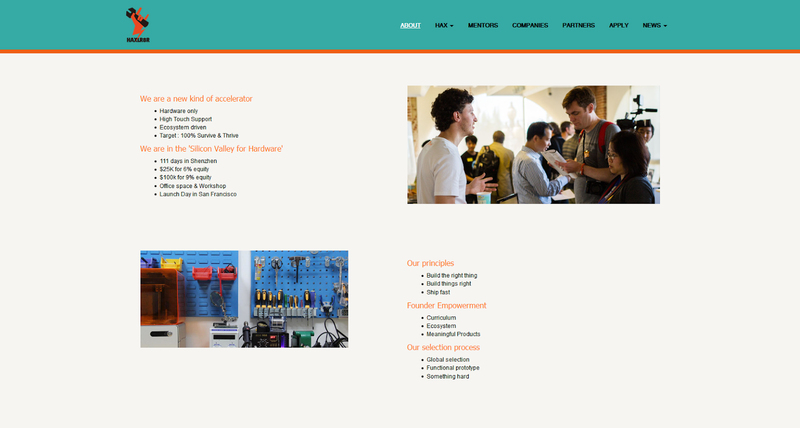 Haxkl8r is a hardware business accelerator that combines workshop space with mentorship and venture capital opportunities and official bases in San Francisco and Shenzhen, China. That being said, I can't help but note that most of these maker spaces that I've found that are designed specifically to support start ups has been in universities. Pictured here is the "Industrial Courtyard" where students and recent graduates of the university where I work can have access for prototype or product development. In some ways, this brings up us full circle because it's been said the originators of the first hackerspaces set them up deliberately outside of universities, governments, and businesses because they wanted a form of political independence and even to be a place for resistance to the bad actors of these organizations. The commercialization of the space means more people have access to the ideals of these spaces - but just as when "Open Source" opened up the door to more participants, the blatant political statement of "Free Software" was lost - hacklabs have turned from a political statement on use of space and voice into a place for production and participation in mainstream culture. 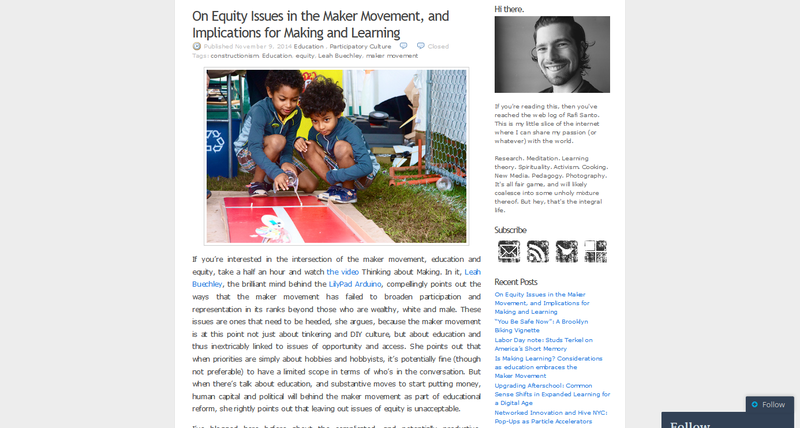 For as neutral and benign makerspaces seemingly are ("everyone likes to make things"), there are reasons to be mindful of the organizations behind them. 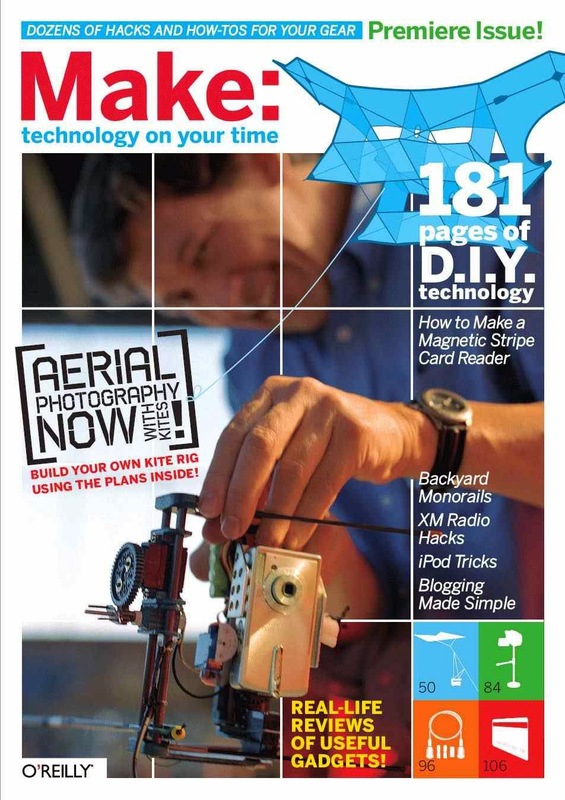 For one, in 2012 Make Magazine received a grant from DARPA to establish makerspaces in 1000 U.S. high schools over the next four years. Now it's one thing if makerspaces simply exist as a place where friends and hobbyists can meet, work and learn from each other. It's quite another if the makerspace becomes the basis of a model to address STEM anxieties in education. As much as I appreciate how the Maker Movement is trying to bring a playful approach to learning through building, it's important to recognize that makerspaces tend to collect successful makers rather than produce them. The community who participates in hackerspaces and makerspaces is pronouncedly skewed white and male. In 2012, Make Magazine reported that of its 300,000 in total readership, 81% are male, median age is 44, and the median household income is $106,000. Lauren Britton, the librarian who was responsible for the very first Library Fab Lab/Makerspace is now studying as a doctoral student at Syracuse University in Information Science and Technology and a researcher for their Information Institute. 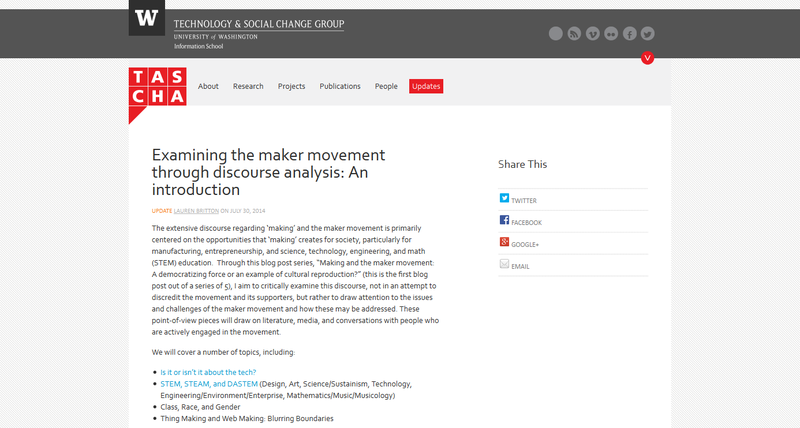 She's been doing discourse analysis on the maker movement and last year she informally published some of her findings so far. She's already tackled STEM anxiety and I'm particularly looking forward to what has has to say about gender and the makerspace movement. But there's no time to get into all of that now, because it is now time to hop into c-base and travel through and time and space to the time before public libraries. 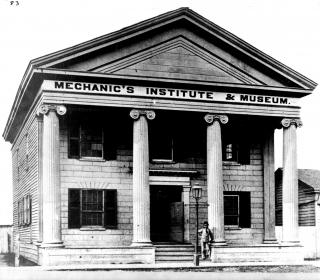 We are going to travel up the makerspace evolutionary tree to what I like to consider the proto-species of the makerspace : The Mechanics Institute. The world's first Mechanics' Institute was established in Edinburgh, Scotland in October 1821. Mechanics Institutes were formed to provide libraries and forms of adult education, particularly in technical subjects, to working men. As such, they were often funded by local industrialists on the grounds that they would ultimately benefit from having more knowledgeable and skilled employees. Mechanics Institutes as an institution did not last very long - the movement lasted only fifty years or so - although at their peak there were 700 of them worldwide. 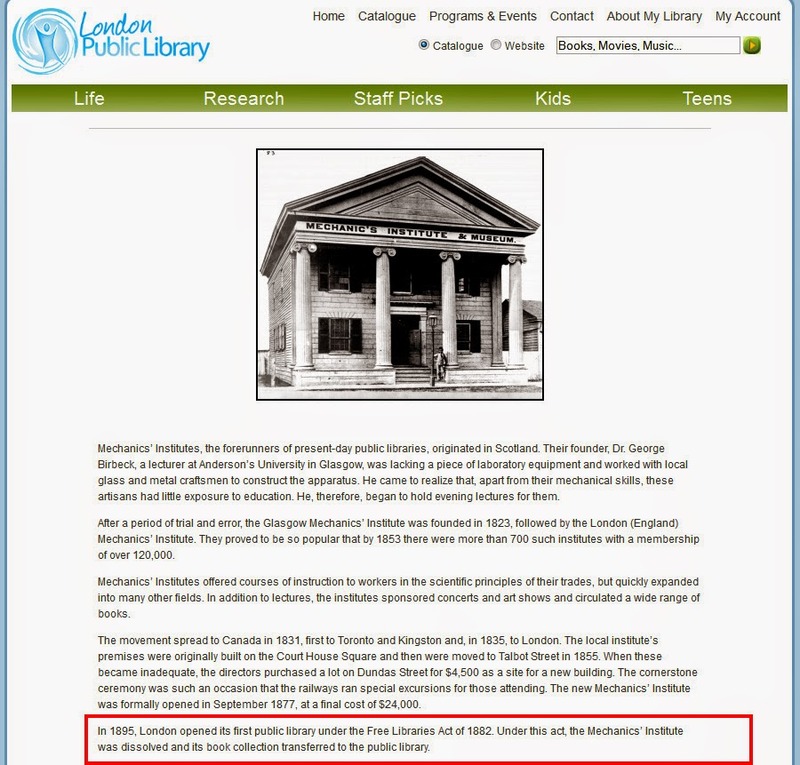 What I think is so particularly poetic is that many of the buildings and core books collections of these Mechanics Institutes- especially where I'm from which is the province of Ontario in Canada - became the foundation for the very first public libraries. Although there are still some Mechanics Institutes still among us, like coelacanths evolutionary speaking- most notably Montreal's Atwater Library and San Francisco's beautiful Mechanics Institute and Chess Room. Now, I have to admit, when I see some makerspaces, they remind me of mechanics institutes: subsidized spaces that exist to provide access to technologies to be used for potential start-ups. And if that remains their primary focus, I think their moment will pass, just like mechanics institutes. The forces that made industrial technology accessible to small groups will presumably continue to develop into consumer technology. To live by disruption is to die by disruption. This is one reason why I'm so happy and proud of the way so many libraries have embraced makerspaces and have made them their own. Because by and large, libraries keep people at the centre of the space- not technology. Librarians - by and large - have opted for accessible materials and activities in their spaces and have host activities that emphasize creativity, personal expression and learning through play. 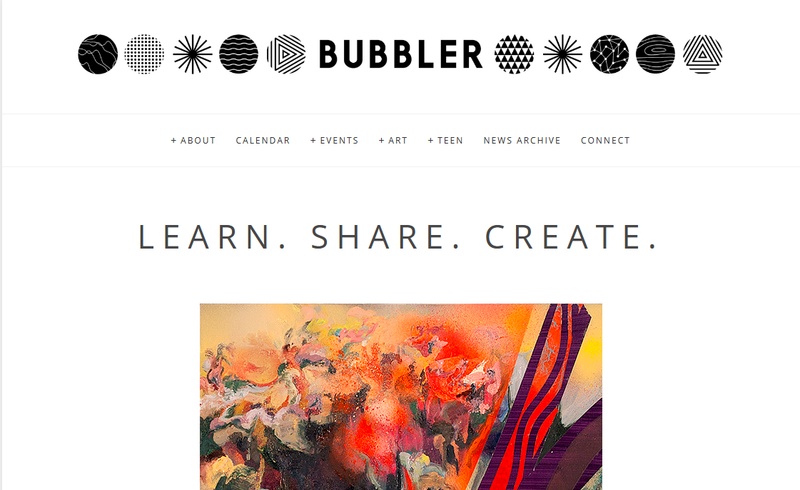 This is The Bubbler which is a visually arts based makerspace from the Madison Public Library. I have never been but from what I can see, they are doing many wonderful things. They hosts events that involve bike hacking, audio engineering, board game making, and media creation projects. I was particular impressed how they are working with juvenile justice programs to bring these activities and workshops to justice involved youth. As long as libraries can continue to focus on building a better future for all of us, then we can continue to be a space where that future can be built. This concludes our tour through time and space. Thank you kindly for your attention. May your libraries and your makerspaces be future compatible.